Don't you hate it when a parent shows your baby pictures - This Forum is brought to you by The Mastiff Sweet Spot and Friends of the Forum. Son Ronnie and dear Ch Velvet here at Five Oaks in 1991. Ronnie is now a six foot man working for the Engineering Department of Cambridge University. I'm not advertising, but he is unmarried, smart, honest, good-natured and moral. 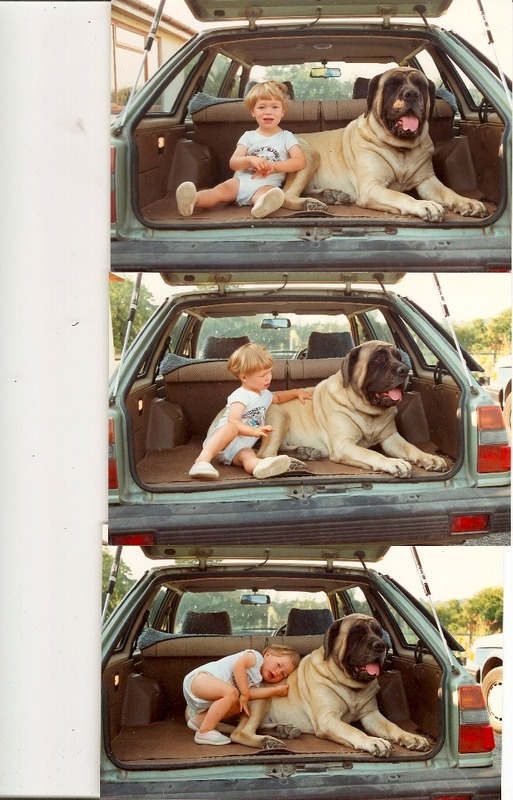 I love baby pictures, especially when it also involves a stunning mastiff. Poor Ronnie, trying so hard to get Velvet to love on him and she being completely aloof. And nice memories for your family. Give him a print of this, framed for Christmas. Thank you for sharing it.